You’ve probably heard the term "microformat" and assumed it to be part of some Web 2.0 flash-in-the-pan movement. But "microformat" is not just a fancy name or trademark — it’s part of a much bigger picture. So, what are microformats? Through the use of these widely adopted standards, publishers can encode additional semantics into the HTML markup of web pages. This gives the pages meaning above and beyond the face value of the HTML elements, allowing them to be consumed, remixed, and mashed up. For example, by adding some semantic markup to a web page that describes an upcoming event, properties such as the event dates can easily be extracted and used by other services and software, like calendars and personal organizers. Microformats are all about representing semantic information encoded within a web page, allowing that information to be leveraged in ways that were possibly never conceived by the original publisher. The idea to put more semantic information directly into HTML is nothing new — people in the web industry have been discussing this concept for over ten years — but, through the efforts of many volunteers, enough documentation, support, code libraries, and tools have been created to generate significant momentum behind microformats. The idea is finally becoming reality. Now, if your eyes are glazing over and any further mention of semantics, encoding, data formats, or even standards will send you straight back to YouTube, just hold on. I’m going to demonstrate that using microformats is simplicity itself. It may only be as hard as adding a class name to a single HTML element. Trust me — I’ll show you how to get the most benefit from microformats with the least amount of effort. Two of the most common forms of data being published using microformats are those relating to people and events, and I’ll cover both in this article. To borrow an analogy from the microformats.org web site by way of illustration, it can be said that microformats attempt to pave cow paths. You see cow paths every day: outside libraries, in parks, and around colleges. People always cut the corners of paved paths, make their own paths, and generally flatten the grass along the way — thereby revealing the path to the others who follow, like so many cattle. Instead of attempting to force people to follow the established paths, why not readjust the paved paths to follow the cow paths? In this way, microformats allow people to use cow paths, or rather to leverage more value and meaning out of information already published. Microformats succeed because they don’t force you to change habits: you don’t need to change what you publish, only modify your HTML slightly. How many copies of your user profile exist on the web? Just about every site you’ve ever signed up to has a page about you, with your name, nickname, email, URL, and other basic contact information. With the use of microformats, we can make that information much more useful. Imagine being able to import your user profile from a web site into other applications without copying and pasting the text. Your profile could be aggregated across the Web to create an Internet-wide profile, saving you the trouble of having to sign up with the same data multiple times. Your friends could easily add you to their contact lists with a single click and effortlessly keep up to date when your details change. Imagine no more! hCard is a microformat designed for just this sort of role, modeled on the widely adopted vCard standard. You mightn’t know it, but your address book application has probably been importing and exporting vCards for over a decade now, while your mobile phone has been happily passing contact details around in vCard as well. There’s no sense in reinventing the wheel if something already works well — the hCard microformat benefits here, because anything that can read a vCard can easily read an hCard with only a little extra help necessary. The hCard microformat is used to mark up people, places, and organizations. The only property of hCard that is required is a name; everything else is optional. This is an important point, because one of the other microformat principles is to not change the way people are already publishing. If you’re not publishing telephone, email, or address information, then hCard doesn’t force you to begin. "vcard" acts like a container, saying all the data inside this <li> element is data to be considered for this vCard. Now, I'm sure some people will protest, "Hey, you're abusing the class attribute -- it's only for CSS!" This isn't true. According to the HTML4 spec, the class attribute is a general-purpose attribute for user-agents. Microformats are a perfectly acceptable use for the class attribute; the class attribute does not only apply to CSS. We've added a class value of "fn" to the <a> element. "fn" corresponds to the vCard value FN, which stands for "formatted name" and is used as the display name in many applications. Now, I can hear you asking, "Can you have multiple values in a class attribute like that?" The answer is, "Sure!" The class attribute is very flexible, and you can add as many space-separated values as you want -- CSS classes or otherwise. This is perfectly valid markup for HTML and microformats. So there you have it. With very little effort, we've now added an hCard microformat to our blogroll. If any microformat-aware software was to open our web page, it would be able to extract the full names and associated URLs of our contacts without ambiguity. More information about hCards can be found at the microformats.org site. The site describes all the possible properties you can use to add semantics to the person, place, or organization. Some of these properties include addresses, telephones numbers, emails, web sites, and organizational roles. As a publisher, you can learn these properties and edit your HTML by hand, or use one of the helpful microformats creator plugins which add them for you. There are not many properties to learn and they are reasonably self-explanatory. There's also a cheatsheet to help you. Second only to information related to people and places, the most common piece of information published online regards events. People are publishing all sorts of time-related information without even realizing it. To help add more semantics to this data, the volunteers at microformats.org created the hCalendar microformat. Much like hCard, hCalendar is based on an existing widely adopted format, iCalendar. we should all meet up at my house for pizza. The first step is to add a class of "vevent" -- this addition tells a parser that everything inside this <p> element is data to be considered as related to this event. In the previous hCard example, I used an <li> element. Microformats don't force you to use any specific HTML element, but depending on which element you do use, additional semantics can be implied. we should all meet-up at my house for pizza. Lastly, the most important part of communicating any event is specifying when it will occur! This is one aspect of microformats that exemplifies why they're designed firstly for humans and secondly for machines. As humans we comprehend the meaning of "next week" easily, but computers are not so capable -- we need to give more precise information in order to describe what "next week" actually means. By using the <abbr> element and adding a class of "dtstart", we're saying that this data is the date-time start for this event, but the computer doesn't know what "next week" means. Instead, because this is an <abbr> element, the parser can look to the title attribute for an answer to the meaning of "dtstart". There it finds the ISO date. If you're wondering why I chose the <abbr> element, you can find more information about it here. Once the information has been encoded into the text, it can easily be extracted and exported to various calendaring applications: sent locally to the computer or phone, or to remote web-hosted calendars, or shared with friends, or even distributed among mashups that are yet to exist! So How Can I Get Started with Microformats? There are several tools out there that you can use to both help you create microformats and extract them usefully. The hCard creator is a web-based form that you fill out -- this dynamically generates the HTML that you need to paste into your web page. Similarly, there is an hCalendar creator. There are also libraries and plugins for Dreamweaver, Textpattern, WordPress, and many, many more on the microformats hCard and hCalendar web pages. But what good does it do you to publish microformats if you can't extract them? Well, there are plenty of tools to help you to extract and manipulate microformat data. There's a Firefox plugin called Operator, which detects microformat content within the currently viewed web page and provides relevant options and tools. For example, if hCard content is detected, Operator will list the contact names and present an "export contact" option. This plugin is used in the example screenshots below. Operator is very handy because it not only extracts the data, but also alerts you to the presence of data on the page. Technorati hosts microformat web services for hCard and hCalendar. If you submit the URL of a web page containing hCard or hCalendar information, this web service will return the vCard or iCalendar equivalent. Technorati is also currently testing a microformats search engine. If your site's listed in the Technorati index, they index any microformats that are found in your HTML. This data then become searchable. Eventually, you could have a tailored iCalendar subscription of only events in your city with keywords like "jazz" or "tech" or "Frisbee;" the Internet becomes your database. This is the first step toward that semantic search that has been a vision of so many, for so many years. Someone is likely working on one for your favorite language right now! Who's Using hCard and hCalendar? There are several organizations that have begun to encode their data using microformats: some you might have heard of, others you probably haven't. Yahoo! is a big supporter of microformats, incorporating them into many of its properties. These include Yahoo! 's photo-sharing site Flickr, its events site Upcoming, and its tech and local sites. Flickr, as shown in Figure 1, uses microformats to mark up the user profile pages with hCard. It's now possible to extract the user profile directly into your address book from a Flickr profile page. 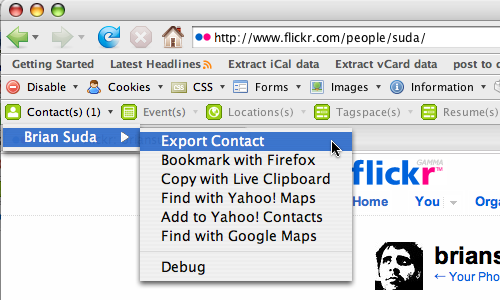 If you use the Operator plugin for Firefox, you'll see that you can export the contact details to a variety of different address book clients, both locally and on the Web. Upcoming, depicted in Figure 2, uses the hCalendar microformat to mark up events. This makes using Upcoming so much easier, because even as you browse an event page you can import it directly into your calendaring application. The Yahoo! tech and local sites use the hCard microformat to mark up local companies. Now, when you search for a pizza place on Yahoo! local, it returns all results with hCards so that you can extract the telephone numbers for easy dialing. One of the more surprising supporters of microformats has been the Cambodian Yellow Pages. This company marked up its entire phone directory with hCards -- instantly creating millions of instances of semantic data on the web -- just by editing one template in its content management tool. Just to have a peek at the potential of microformats for portable social networks, let's consider Dopplr. Currently in private beta, this an online service for frequent travellers. One day, when it's released, you'll be able to create a new account and import a list of your friends by submitting a URL that has content marked up with the hCard microformat. Dopplr will parse the page, extract the people, and search its database to find your friends. 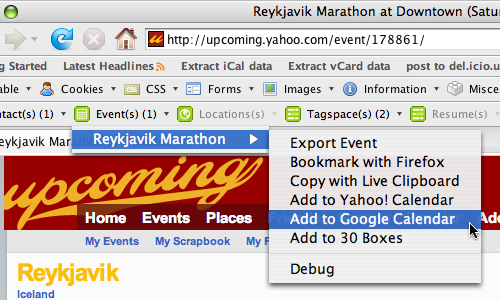 Dopplr also can import hCalendar data. If you plan to travel to an event, you can submit a URL with hCalendar data; Dopplr will parse it and block out those dates on your travel schedule, so your friends can keep up to date on your whereabouts. Even recently, Microsoft has jumped on board with a brief tutorial about how to mark up the contacts in SharePoint with hCards. What Does the Future Hold for Microformats? The future looks bright for microformats! That much is made evident by the manner in which major organizations, such as Yahoo!, have perceived the potential of microformats and implemented them in a variety of ways. Likewise, browser vendors have expressed interest in adding functionality directly into the browser to detect and act on semantic markup. Imagine that the browser on your mobile phone or PDA automatically detects multiple hCards on a page. It adds a menu item to call the numbers or, if configured accordingly, it imports them directly into your address book. If there's a postal address, the browser automatically pulls up Google Maps, and shows the location on a map. All this free movement of data doesn't stop with contacts, however -- the same applies to events and other structured data. If the browser finds hCalendar data, it can import the calendar information into the local calendar application, set reminders, and find the event location on a map. The best part about all this is that microformats are invisible to the end user. The average person doesn't have to understand microformats or even know they are in use. Essentially, microformats facilitate this functionality for free. RSS readers are very popular these days. Wouldn't it make sense to build similar functionality into an address book? Right now, the only way I can keep my address book up to date is by constantly copying data from friends' emails and web sites into it. It's a boring, repetitive, time-consuming task. With an RSS pull-style address book, on the other hand, my friends could simply publish their data online with microformats and the address book application would poll their web sites, searching for any updates. My friends and contacts wouldn't need to spam their entire address book so as to alert everyone to the changes; they need simply update their HTML, and the next time this new address book application checks the site, it'd automatically update the local entry to reflect the changes. I'd "subscribe" to my contacts' web page for address book updates. Many calendar applications already do this with event data, so why not with people too? These are only a few simple examples of what could be possible if publishers encoded more semantic information into their HTML. And again, in all of the above examples, the end user doesn't need to know or care that their data uses microformats -- just that it works. The microformats community is strong and vibrant. It's very open, too, so anyone can help make it a better place by adding examples, implementations, and documentation to the Microformats Wiki. Of course, the most obvious way you can contribute is by adding microformats to your own web sites and advocating their use. With microformats, you can transform your web site content from plain text to meaningful packets of information that can be remixed and consumed in ways you may never have thought of!